It’s October which means spring break time here in Australia! I still find it difficult to wrap my head around the seasons here. I love the warm weather but my brain keeps telling me that October is fall, not spring. My host family is so incredible and let me take a few friends to their beach unit in Caloundra. 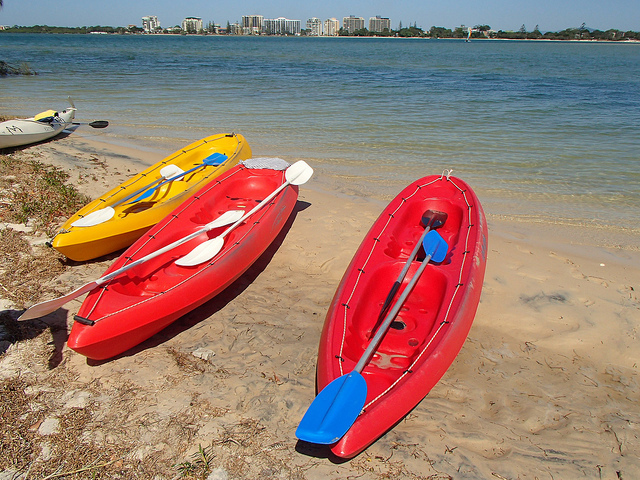 A fun little getaway up the Sunshine Coast can always rejuvenate your spirits! 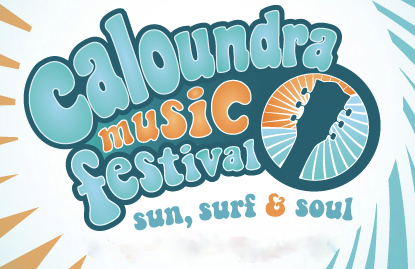 We made it up in time to attend the launch of the 2013 Caloundra Music Festival and enjoyed great music from the Sierra Leone Refugee All Stars at the Surf Stage. We put our blanket down, ate some Vietnamese baguettes, and danced the night away. The evening culminated with fireworks on the beach which was just lovely. The weather was absolutely beautiful. The next morning, we rented kayaks from Golden Beach Hire who are awesome and hail from North America! They are so friendly to us every time we use their equipment which ranges from stand up boards to catamarans. We ventured over to Bribie Island and found a private beach where we did hand stands and head stands for a while! Doing a hand stand is quite difficult but fortunately, I have great friends who assisted me. Then, we just enjoyed the beautiful water and soaked up the sun. We took a few jumping photos that really reflect the fun we were having on the beach. I definitely don’t take for granted the gorgeous scenery surrounding me. As we do, hunger struck and we decided to head home and make a healthy lunch of chicken salad with some pasta on the rooftop. We all love avocados and can’t imagine a meal without it. The price of avocados are crazy here though. They cost anywhere from $2-4 for EACH ONE! My mom eats them every day and we can purchase them for 29 cents to 89 cents (which is pricey) for each one. Avocados have given me a wake up call here in Brisbane. Actually, grocery shopping in general shocked me. You can easily spend $100 on groceries for one person a week which is quite exorbitant compared to the United States. I know that prices vary depending where you live in Australia or even in the States but I would say on average, I pay twice or three times as much here in Australia for groceries and rent compared to the United States. After having a discussion with my host family, he enlightened me that the supply and demand here in Australia is much smaller than that in the States. With that said, it makes a lot more sense why the prices are a bit higher but it still hurts the student pocket. 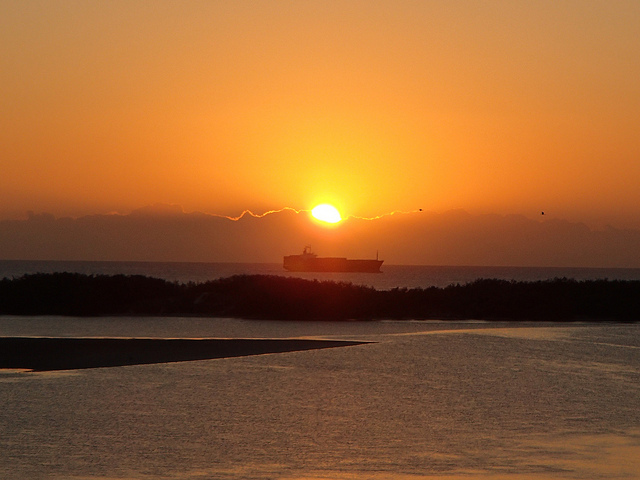 Another thing that I love about being in Caloundra are the sunsets and sunrises. It’s truly the most magnificent moments in a day. The sky changes rapidly in a matter of minutes and I am just left speechless. I was talking a million miles a minute to my friend Remy and all of a sudden, we were both silenced. With the ship passing by at sunset, the sky turns from blue to orange in a flash. The perfect way to end an active day on the water. The next day, Sara took us to the best gelato in Caloundra. Make sure you go by Milano Gelateria next time you make a trip up the sunshine coast. There are no tasting here but I can forgive that. I ordered the pistachio, stracciatella, and passionfruit. The passionfruit was hands down my FAVORITE. I am craving some this instance and wish I could blink my eyes a few times for it to appear. We all loved Sara for sharing this gelato place with us and for the quality friend time we had over the much needed break. Queensland has so much to offer in terms of nature and if you want a more relaxed vibe, the sunshine coast is your way to go. For more fun photos from my Caloundra getaway, click here!